As you would probably guess, the Pennsylvania is located on Pennsylvania Avenue. 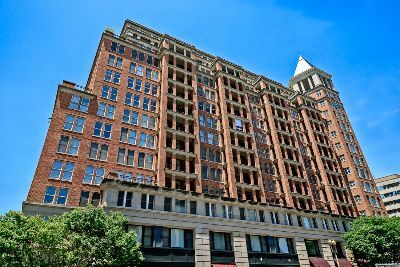 The building is also in a part of Washington, DC known as the Penn Quarter. But if you were also to guess by its name that this is some grand old Victorian structure from yesteryear, you would be wrong! While the 14-story gray monolith does present something of a throwback Art Deco/Mayan style, it was actually born in 1991. The actual street address is 601 Pennsylvania Avenue NW at the corner of 6th Street in Washington, DC’s 20004 zip code. This is the heart of the city’s power belt—between the Capitol Building and the White House. You don’t have to be a politico to live at the Pennsylvania—but it’s okay if you are. There are 99 one and two-bedroom luxury residences here, with open floor plans, private balconies, and super big windows. And while not all of the condos for sale have updated gourmet kitchens with all the modern stainless steel-type things, many of them do. There’s washers and dryers in every unit, and underground parking as well, although that will cost you extra. Condos for sale at the Pennsylvania usually start in the mid-to-high $400s and climb from there. 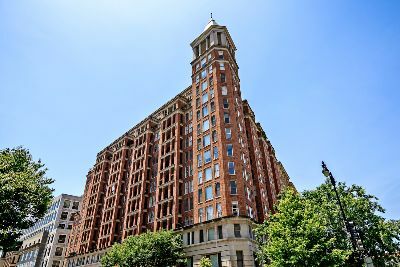 The building has 24-hour concierge service, a state of the art fitness center with sauna, a party room, a bike room, and a tiled rooftop terrace with commanding views of the Capitol dome and other landmarks. There is also commercial space on the ground floor, including one of DC’s favorite watering holes and eateries for the political set—the Capitol Grille. Also nearby are such well known places as Market Square, the wonderful museums at the National Mall, historic theaters, and several close by Metro stations, including the Archives which is only a half-block away. And if you don’t want to dine immediately downstairs, you can stroll to any number of other fine places, like 701 Restaurant with live jazz, Central Michel Richard, or Plan B Burger Bar where you can sip bourbon with your burger. How DC is that?